To enter this giveaway, please log in your email or Facebook account via the Rafflecopter widget below. (I'm trying out the Rafflecopter for the first time, please email me at bentomonsters@gmail.com should you have problems using it.) Increase your chances of winning by sharing this giveaway via twitter, Facebook or on your blog. Each share gains you two extra entries. Giveaway is open internationally. The winner will be picked randomly, and it will be announced on next Wednesday, 26 December 2012. So, please check back this post for the winner then. The winner has 48 hours to respond to my email, after which I will proceed to pick a new winner. Good Luck! Thanks for hosting this giveaway! Super cute! Thank you so much for hosting this! The picks are so cute! Arghh....this is so cute! Wish me luck! The picks are so adorable! Have entered my email and shared this giveaway on my facebook. Hope I can win! Very cute picks! Thanks for the giveaway opportunity. 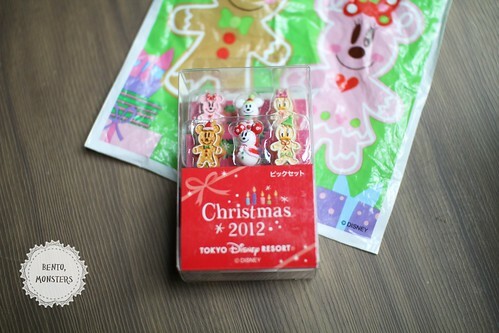 Lovely and cute pick, I wish I could win this as my christmas pressie. So cute! Love them all. I'll blog it in this week's post when I write it later today. I have to pass along a compliment, a friend of mine saw your Wall-E and Tigger bentos and was absolutely in love with them. Deng!.. i wish i could win this!.. Those picks are so cute! Sorry I forgot to write my name, here is my re-entry, thanks & sorry. They're so cute!!! Good luck everyone!